As the improving global economy presents both volume and pricing opportunities in some segments of Industrials and Materials, we use our historic framework to identify where opportunity still exists. 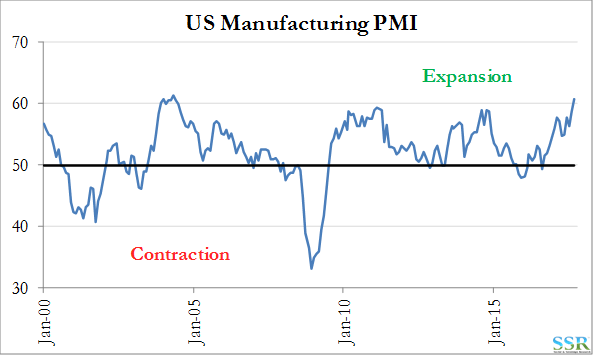 Steady but slow economic growth over the last seven years – coupled with a general underinvestment, driven by the slower growth and conservative capital deployment strategies because of economic uncertainty – is starting to cause some supply limitations. “Incremental investment” decisions, adding capacity for specialty chemicals/intermediates, suggesting shortages – $25-100 million projects with quick implementation. We are also seeing an unusually high number of price increase announcements for intermediate products and specialty chemicals – some hurricane and supply chain driven, but plenty before the hurricanes appeared. Demand surprises (partly because of incremental inventory builds) trigger fear of a shortage and give legs to price increases that producers are pursuing, primarily because they are seeing a need for reinvestment without the margin to support that re-investment. We think that the US hurricanes are that trigger and while we have focused on ethylene in recent research, the implications stretch far wider with many sub industries impacted – we expect more positive demand trends in many segments. In many cases this will add pricing power to volume growth. 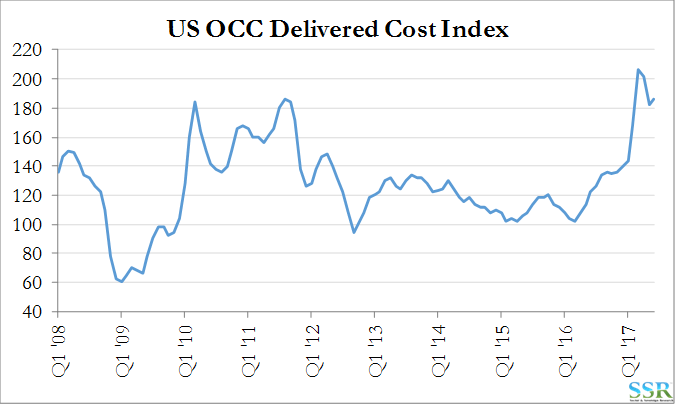 The upside is operating leverage – with low growth for years, companies have been cutting costs aggressively. Volume and price gains should drive exceptional earnings leverage. Generally, stocks are not cheap – but many are a long way from prior cyclical highs in terms of return on capital and premium to normal value. This where our “normal value” framework becomes a very powerful tool. Overview – The Case For Higher! 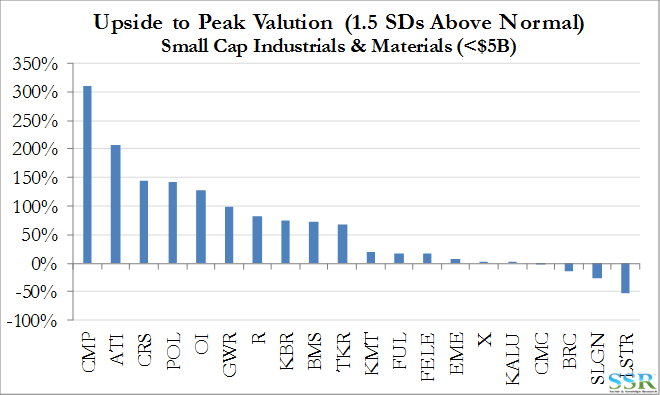 Many Industrial and Material stocks look expensive, and we have covered the issue with the Industrials sub-groups over the last couple of weeks. As we work on this theme, I am reminded of my last piece of written research prior to leaving my job as a full time chemical analyst in the spring of 2004 – it was a downgrade of then Georgia Gulf from buy to hold at what was then a share price of close to $32 (anyone wanting to check my data needs to remember that GGC did a reverse stock split 25/1 following the financial crisis and the equivalent adjusted price would be around $800 per share). The stock had performed well in the previous 12 months – up 60% – and was screening as expensive on our normalized framework. 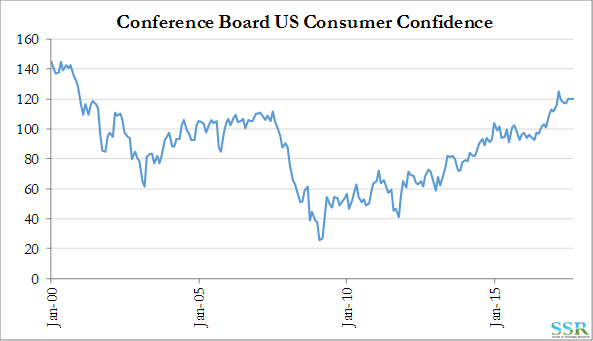 It sounds like a good call in the light of what happened in 2009, but it wasn’t, as the stock peaked at $57 in November of 2004 – 80% higher than when I had downgraded it! As we have noted in the Industrials work that we have done in recent weeks, what appear to be expensive stocks can keep working in this market, if they have the momentum – as long as earnings and revisions are moving in the right direction, even if absolute earnings expectations do not quite justify value. This was the case with GGC in 2004. PVC prices rallied 13% from April 2004 to November 2004 and ECU values (chlorine plus caustic) rallied by 60% over the same period. GGC had the pricing and estimate momentum, even if valuations seemed too high. Getting 60% of the stock was good – missing the next 80% not so good. In our Alcoa piece published this week we are attempting to quantify the upside, assuming that momentum continues – even though the stock has done well so far, this year. In this piece, we try to identify those companies exposed to trends that are likely to keep driving both volume and price opportunities – leading to operating leverage and meaningful earnings growth – and where valuation gaps still exist. One the other side of the equation we look for stocks that have rallied too much, do not have the momentum and are unlikely to get it. 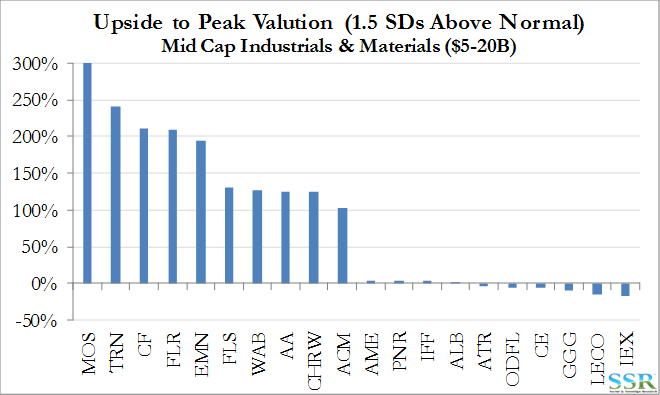 We have cut the analysis into three cap groups. Note that in Exhibit 2 we see more hurricane driven potential business as a negative for the E&C space – this is because the companies do not have the resources to handle their current order backlog efficiently – driving cost over-runs and earnings shortfalls. We do not think that any of the companies has the capacity to take on short-term work, related to the hurricane damage, and drive positive EPS surprises as a consequence. Lack of growth, in our view, sits in the following areas: note that many of these are robust businesses, we are just unclear how they grow to higher annual rates from here. In short, we are looking for stocks exposed to the first group of end-markets with valuation upside and we want to avoid stocks more exposed to the second set and at valuation extremes. At the stock level, our conclusions are summarized in Exhibit 1 – there are some pure play gold and E&C names that appear to have greater upside than those in the table, but our concerns in both sectors have kept them off the list. This is a very difficult group about which to make generalities. No two companies do the same thing or have the same portfolios and one company in a given sector may have completely different end market exposure than another. 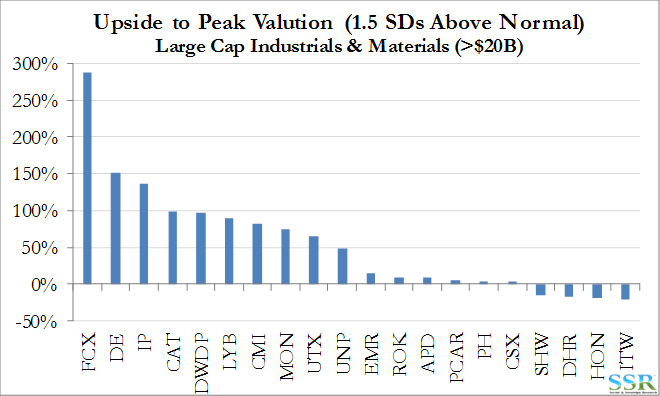 However, at the sector level, all of the groups have bounced off valuation, but equally important, return on capital lows. With the exception of Transports, and possibly Conglomerates, all are short of prior cyclical return highs and therefore earnings have plenty of room to grow, given what for most should be better operating leverage than in prior cycles (you could argue for higher cyclical peaks for Transports and Conglomerates on this basis also). The greatest upside, based on the data, is in E&C, but we are concerned about structural problems in this sector and would probably favor Metals, Mining, Electrical Equipment and Chemicals, because of exposure to many of the levers in the first list above. 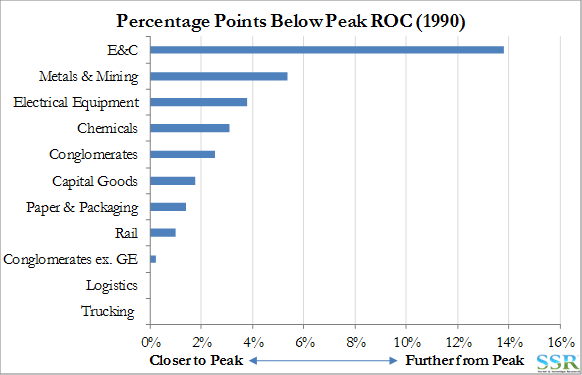 Exhibit 3 shows ROC upside to the most significant peak for each industry (since 1990) – in most cases that recent peak was just prior to the financial crisis. 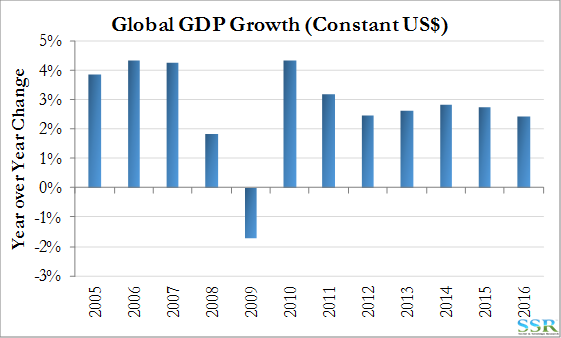 We discussed the consistent growth in the global economy since the financial crisis in a recent Friday Findings, and noted that the global economy has expanded by 20% since the financial crisis. At the same time disappointing annual numbers have discouraged new investment in many areas, while the World absorbed capacity built in excess, as a consequence of the hubris prior to the crisis and in China chasing an industrial economic growth rate that was unsustainable. Some Chinese over-building will be with us for a while, but in many cases demand has caught up with sustainable supply and many industries are not making sufficient returns to support investment economics. The GDP chart that we showed last week is repeated in Exhibit 4, but we add three other indicators of growth in Exhibits 5 through 7 that also look very positive. These all indicate better consumption, but there remains a consumer rather than industrial bias, with the consumer definitely driving the Chinese economy, and while industrial programs are so close you can almost taste them in Europe and the US, they have been for years, and we are not holding our breath. The consumer bias colors our segment preferences in the overview, with the exception of agriculture, which is being attacked from two fronts – greater field productivity because of advancements in seed technology and planting techniques, as well as a step change in food preservation in much of the developing world (so less waste) which, in turn, is driving packaging demand. The only broad industrial initiative of size is in India, with recent data suggesting that this may have peaked. 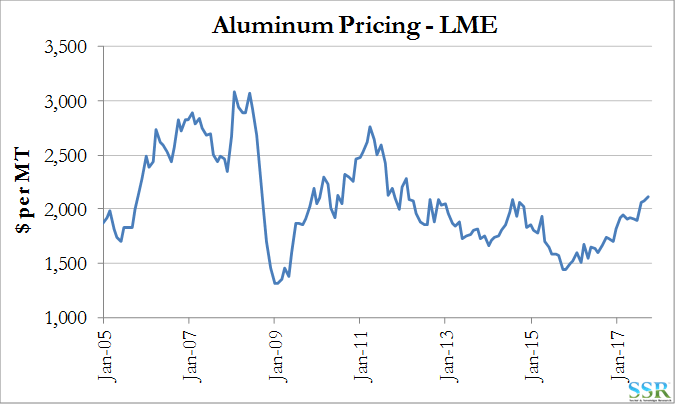 These better macro trends are driving prices for many commodities higher where we have supply constraints – Exhibits 8 and 9 show the momentum in both the aluminum and OCC markets. The momentum would also be evident in ethylene, in our view, if we did not have the overhang of expected new capacity in the US, which is keeping speculative negative pressure on US pricing, while the rest of the world remains strong. We are seeing strength in the PVC market, driven by significant improvements in demand. This analysis is based on a strong, tried and tested, valuation framework, which allows us to project normal, peak and trough valuation for any company within the industrial and materials sectors. The analysis is consistent across all companies: in the Appendix, we run through the methodology for those unfamiliar. As an illustration, we have chosen TRN to show where our mean and peak valuations come from. 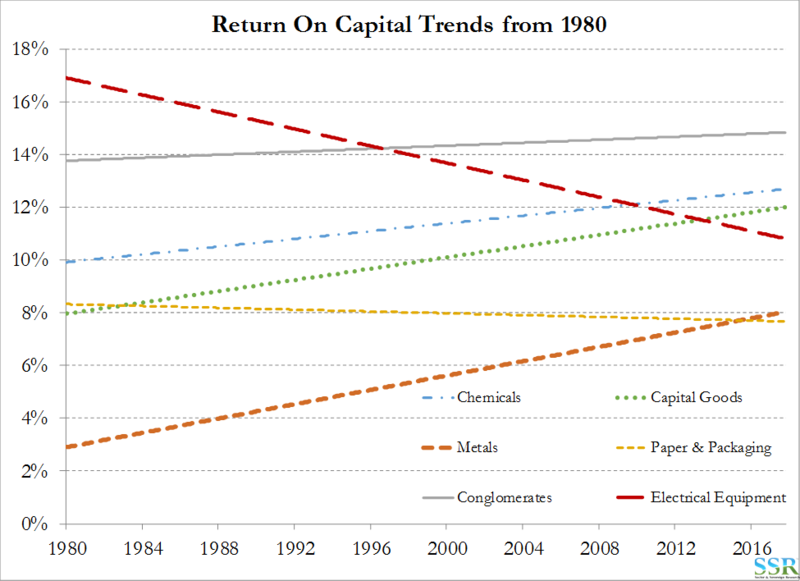 In Exhibit 10 we show TRN’s historic return on capital back to 1990. 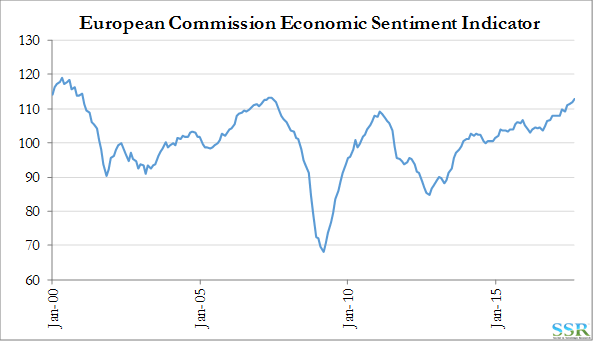 There is a clear cyclicality and a reversion back to a mean of around 8%. Right now, the company is recovering towards the mean, but in a strong rail car build or replacement or repair cycle, coupled with a US infrastructure initiative we could see returns blow past the mean and head back towards the peak of 12% – still probably an unacceptable return for management. The normal (mean) return allows us to generate a normal earnings estimate and a normal value – value may be in line with current returns or it may not. 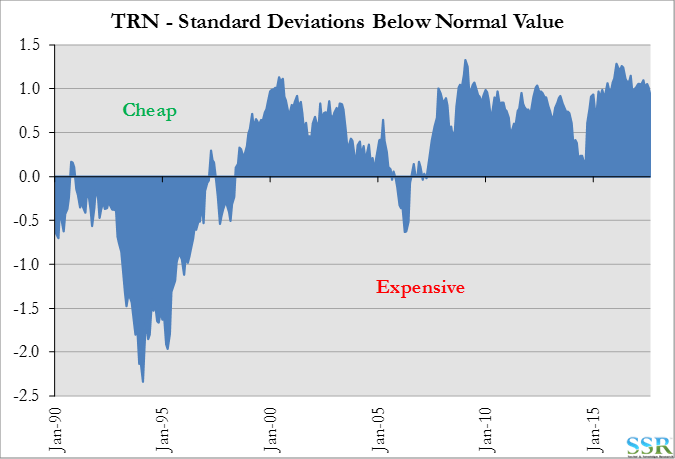 In this case TRN is trading at a significant discount to normal value – Exhibit 11 – and has upside just to move more in line with current returns, let alone any cyclical high. 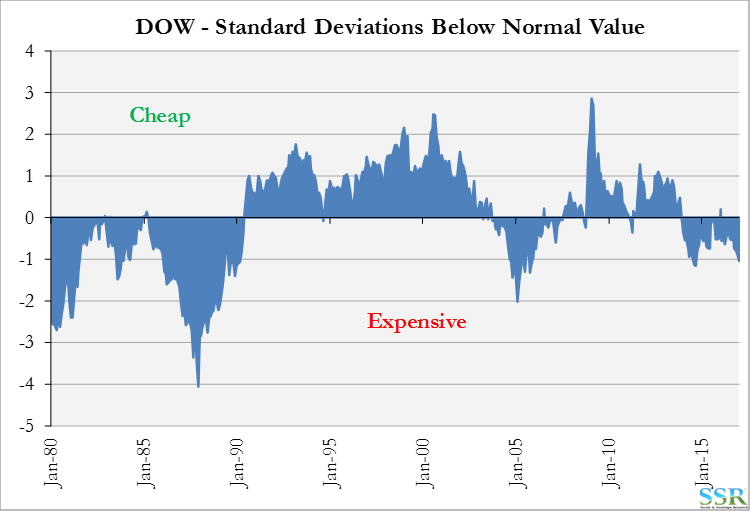 TRN is not a well loved stock; its last earnings peak was highly discounted and the one before that also – a significant decline in skepticism is needed for the stock to perform the way we suggest is possible in Exhibit 1. We have used this broad framework to identify companies with the greatest upside to “peak” valuation – something we only see with peak returns, for which we need to see the operating leverage that a price plus volume cycle can bring. 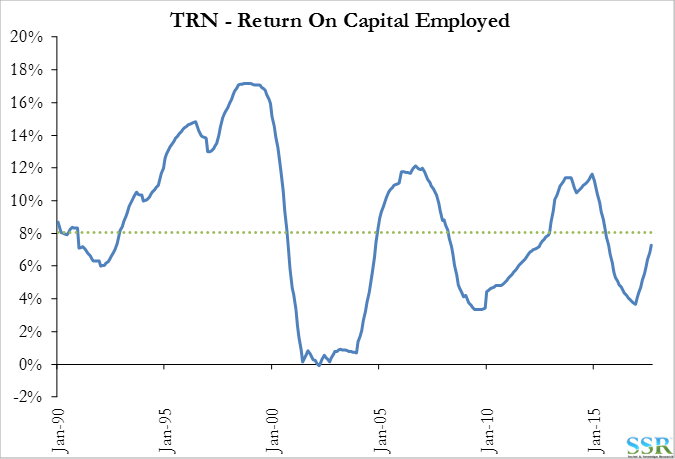 We have assumed that a peak is defined as 1.5 standard deviations above normal – most companies have peaks above that in their history – for TRN it was just short of 2.5 SDs in 1994 as shown in Exhibit 11. The output of the framework for each of the cap groups is summarized in Exhibits 12, 13 and 14 where we show the 10 with the most upside and the 10 that closest to peak (or above) today for each market cap group. These are unqualified results – just what the framework generates. In Exhibit 1 we have overlaid the fundamental preferences that we discuss in the overview to create a shorter list of higher conviction ideas. In Exhibit 15 we take our top picks from Exhibit 1 and add some color with respect to what we would need to see to get the upside. The second group – Exhibit 16 – those we are concerned about – have all run far ahead of earnings/returns and do not appear to have the momentum to justify the peak or close to peak values. They have excessive “hope” built into valuations in our view and need far more of an economic uplift to work from current levels than the companies highlighted in Exhibit 15. The basis of our framework is valuation – anomalies at the cheap or expensive end of the spectrum are candidates for future research as we try to justify/disprove the market sentiment embedded in valuation. Trends can be different for companies in the same industry – the industry trend can be upward sloping while a company trend is downward sloping (the Chemicals sector and the former DOW provide a good example of this). We show historical return on capital trends by sector in Exhibit 17. We use a company’s trend or average return on capital to drive a “normal” earnings figure. This in turn is combined with a normal earnings multiple that we relate to the S&P to derive “normal value” based on the company’s historical averages. Extreme premiums or discounts from this normal value give us a broad opinion on valuation and indicate opportunities/areas for deeper research. 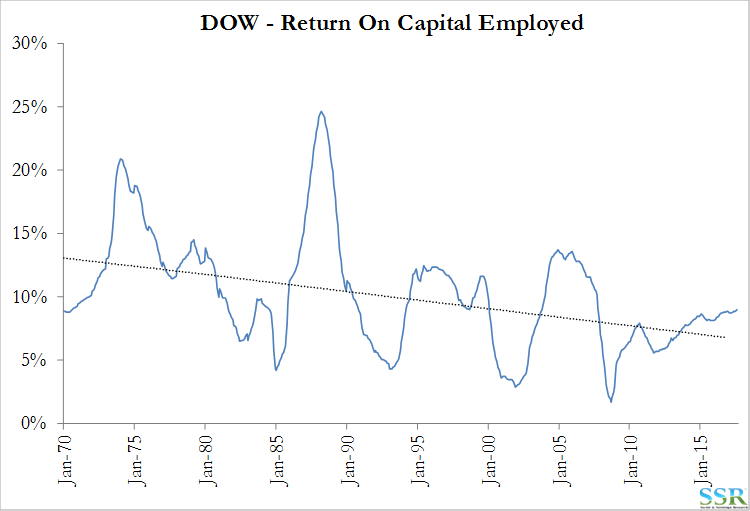 We show the return on capital profile for legacy DOW, and the familiar valuation chart derived from that ROC below in Exhibits 18 and 19. The reverse would be said for an expensive, under-earning stock (the lower left quadrant in Exhibit 20). 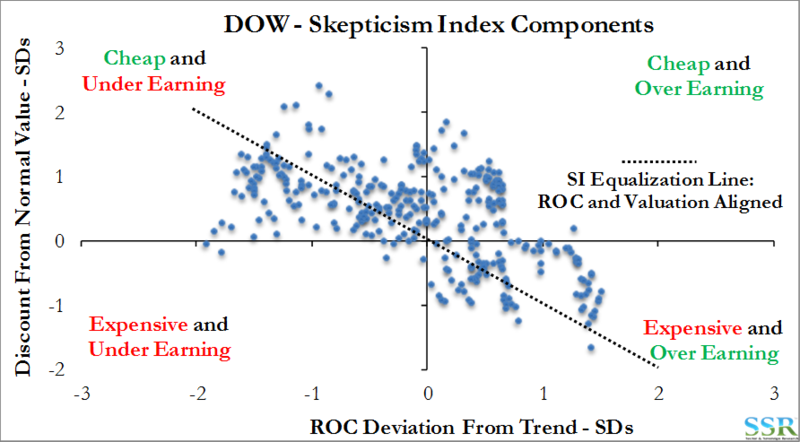 Our normal value framework is a screen to identify cheap/expensive outliers – the Skepticism methodology helps understand what is priced in and when things might change.